Why bring this up, you ask? Back when it was cool to be a villain with a shtick the Penguin was a top dog. Iconic and simple, he was a squat gentleman thief who used his trick umbrellas and penguin motif to escape from Batman time after time. But the Golden Age is over. Now? From Tim Burton to Alan Grant, writers have struggled to make this character modern. Is he a mutant? A Fence? A Snitch? Is he crazy or sane, dangerous or campy? In all these variations only three things seem consistent. 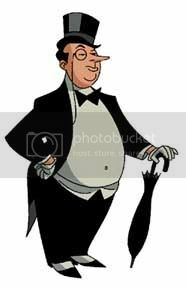 ONE) He wears a tux, topper, monocle and spats. TWO) He’s got a big schnoz. THREE) He has parent issues. SO GET READY for the bold new direction for the Penguin in the NEW 52 universe! It promises Pain and Punishment! It will be crazy modern, to be sure. MY hope? The comic ends with Batman framed dramatically in a doorway, standing around dramatically. We’re sure he’s here to catch the Penguin after one of his crimes…but what’s this? Batman starts fondling the Penguin’s bumbershoot?! We see the Penguin straddling old Bats, his tuxedo jacket draped around his bare, flabby shoulders and confessing this happens once or twice a month. NOW THAT’S MODERN! THAT will save DC from claims that the Catwoman reboot was sexist. Just like the Army, Batman’s an equal opportunity employer. As an Agents of Atlas fan, Avengers 1959 #1 also tickles my interest. This team, which includes Kraven the Hunter, Sabertooth, Bloodstone, the Silver Sable, and many other weirdies, gives this book a reluctant, murderous Rat-Pack feel. Noice! X-Men: Schism #5, Wildstorm’s Supernatural #1 from Brian Wood and #2s for Detective Comics and Action Comics round out some other fun picks for the week! Enjoy! Comic Book Legal Defense Fund Singing! Shiny Shoujo Versus Sporty Shounen— FIGHT!